On Coffins & the Spirit-Led Life • Run Hard. Rest Well. Jesus is the poster-child for the Spirit-led life. “Out of my league,” is my initial response. He’s God. I’m not. Ask my family. They will verify, in flowing narrative, the degree of my fallen nature. As a child, I never had a hard time recognizing the divinity of Christ. His humanity, however, was harder to grasp. For me, His divinity overshadowed His humanity. It felt like He always got the “Pass GO and get $200” Monopoly card. Jesus did not get a “Pass GO and get $200” card—ever. His was a life of rejection, betrayal, missed meals, fatigue, fickle friends and torture. On top of that, the realities of a human body were also His: a sun burned face, sore feet, blistered hands, a pebble in his sandal, dust in his eyes, and about everything else we can imagine…hangnails, heartburn, headaches. His divinity did not trump the “nit and grit” of life on earth, yet He lived for one thing. Can that desire be my desire? The driving force of my life? About ten years ago I read through the Gospels, blue highlighter in hand, looking for passages that spoke of Jesus’ time with His Father. The fact that Jesus prioritized prayed, also astounded me as a child. “Prayer was about getting things from God. What would He need that He couldn’t get Himself,” I reasoned. The Gospel of Luke is covered with blue in my Bible. Jesus was a man of prayer…personal, private, and intentional. Maybe, I’ve surmised, prayer is more than just request. Maybe there is something about communion, intimacy and marching orders. Things I don’t always invite or receive, hindered by my ideas of prayer that miss the mark. Luke 4-6 is covered in blue: 4:1, 4:14, 4:42, 5:16, 6:12. I found this “lead up” intriguing as I read the story of a funeral in Luke 7:11-17. Unasked, Jesus “went up and touched the coffin, and those carrying it stood still.” (vs. 14) Whoa, baby! What a way to make a scene. That was not a casual action, a stage show, but a Spirit-led reaction to do the will of the One He knew so well. Not only was a dead man raised to life, but it caused the crowd to see, recognize, acknowledge “God has visited His people!” (7:16 ESV & HCSB). Jesus’ Spirit-led action that day brought life to more than just one man. The news of Jesus spread far and wide. Eyes were opened. Hearts made ready. The pressure is off, dear friends. Being about the Father’s work is beyond what we can do. It’s not about us and our gifts and plans and abilities. We do not have to make or manufacture the work of God on earth. We only need to know His voice. How do we know His voice speaking into ours today? It’s not hard. It’s not complicated, but it does take time. 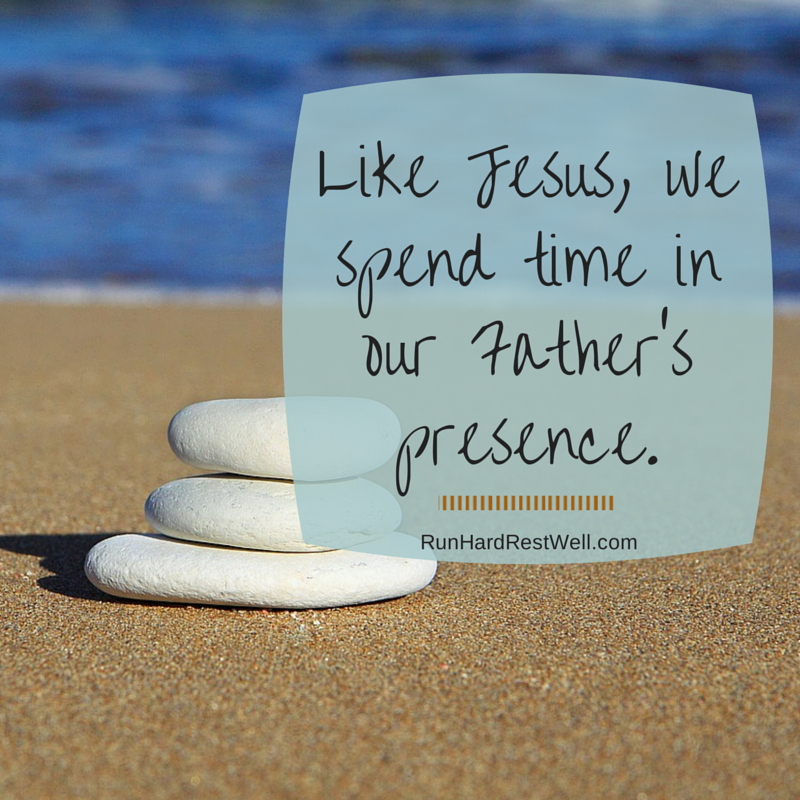 Like Jesus, we spend time in our Father’s Presence. Being in the Presence of God does many things. It brings a stillness and it brings a readiness and it brings tears. Tears of joy and adoration and tears as we recognize our unworthiness and His worth. I wouldn’t rather be anywhere else. I find the Lord brings a silliness in me. I am a child, His child. I skip and I gallop. I sing (I sing badly). I paint. I write, all in his presence. God is good. I’m finding, lately, that I look forward to that few moments after taking communion at church, when I kneel to pray and thank God for dying on the cross and rising from the grave. When I was a kid it felt like a long time of doing nothing, but now I see it as one more opportunity to be in God’s presence. Lately, and I don’t know if it’s just because I’m older, or what, but I’ve been finding that I really crave those few moments after the Lord’s Supper at church. I kneel down and pray for just a minute, but it’s becoming a time where every distraction just seems to disappear so I can focus on God. Great post. I like that you describe prayer as hearing from God rather than just asking God for things. Thank you for the reminder. God has been reminding me of my need to get alone with Him repeatedly. Conversations take time. It takes time to get quiet enough to hear His voice. when I feel like “thin soup” , with nothing left to give, it’s time to be in His presence . You are in my prayers. I like that. I pray for our rescue workers, but I haven’t given thanks. Maybe I need to do both!